And who better to train the you than the professionals at Sierra Diving Center. As a PADI 5 Star Instructor Development Center, we have been training diving professionals for over 47 years. With an on-site staff of 2 Course Directors, 3 Master Instructors, 5 IDC Staff Instructors, 10 Master Scuba Diver Trainers and 4 Instructors we have the largest Instructor/Divemaster training staff in Nevada. If you're considering a full or part time career, or just a way to supplement your own diving we have a program for you. Our Divemaster Course is for you!!! As a Divemaster, you become a master of diving. From now on, you will not only participate in diving, you will represent diving. Did you know that you can enter into the exciting life of a PADI Instructor without making diving a full-time career? Or, can you imagine yourself working in the Caribbean or Hawaii as a Diving Instructor?? As a PADI Instructor, you'll be recognized as an important part of the world's largest, most progressive diver training organization. Just imagine how different your life would be if you were a PADI Instructor. Even if you do not make diving a full-time career, the communication and organizational skills you will learn as a certified PADI Instructor will help you in all areas that you pursue, be it personal or professional. 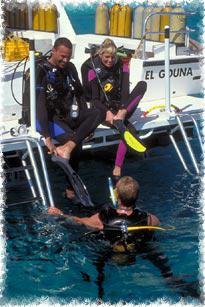 We believe there are several very important reasons why our IDC at Sierra Diving Center would benefit you. Under the close guidance of your course director you will experience the thrill of helping introduce the sport of diving to someone else. Because Sierra Diving Center is a 5 Star Instructor Development Center, we have the ability to conduct the course over a period of time convenient to you. This enables the courses to be structured to fit your needs. To view or print the following documents you will need Adobe Acrobat Reader. To download a free copy of Acrobat Reader click on the image.